Folks, we have a winner! I'm keeping everything from this fix. I requested stuff for warmer weather, since the kids and I are taking a little vacation to Florida. Frances (my stylist for this box) delivered! Not thrilled with my pictures, incidentally. I had my hair in a pony-tail all day, so when I took it down..ugh. And I think it was close enough to bedtime for the kids that I'm not exactly wearing my happiest face ;) Sorry. On with the fashion show! 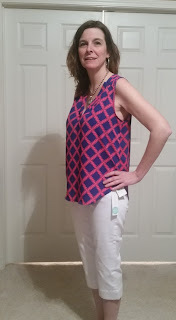 Here we have the 41Hawthorn Shalley Split Neck Blouse paired with the Kut From The Kloth Mattie Capri Jean. I have another pair of Kut From The Kloth pants, so I sort of expected to like these. I was not disappointed. Super versatile as a 'jean' can be, but the white dresses them up a smidge and makes them summery. Yay! Hopefully they wash up well - I'm optimistic about keeping them white while being with kids all the time. 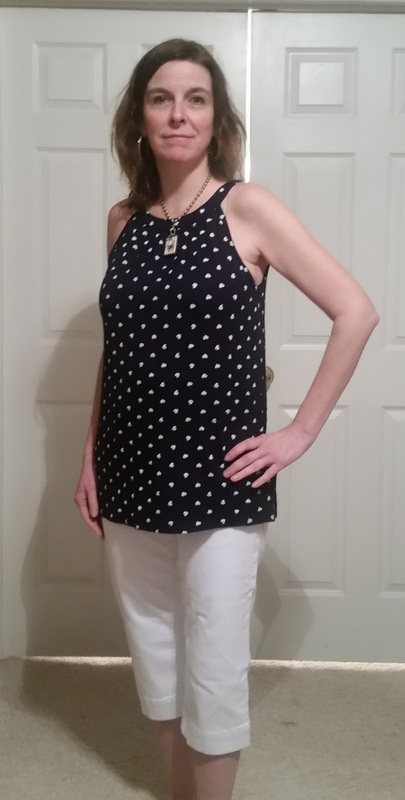 I don't think I have many sleeveless tops, but I decided this is flattering on. The bright pink in the pattern is great, while still having a darker navy base which is more in line with most of my wardrobe. I also love that all the tops the stylist picked for me are flowing and cover my 'mummy tummy.' 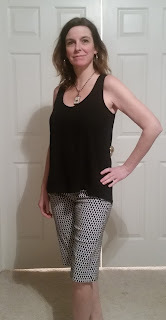 And as stated in my stylist's note, this top would also go well with a pair of denim boyfriend jeans. Again, love the long, flowing length and shape of this top. 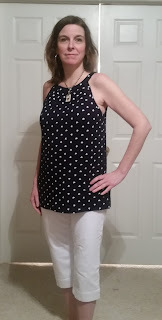 The halter style also keeps it somewhat flattering to my aging, not-muscular arms. My stylist mentions that it will also easily dress up or down between sandals for the beach, or wedges for a night out. This last outfit includes a bit of a surprise for me. It's the Collective Concepts Rover Zip Back Racerback Blouse with the Margaret M Felicity Printed Short. The blouse is one I'm surprised I didn't already have one like. Black, and of a length that I may be able to get away with it with my camo leggings too. Comfy and flowing for the win! As I went to pull the shorts on, I saw there was no zip/button/fastener, just a lot of stretch and a bit of a panel to help it all lay flat in the front. Yay for old lady shorts!! They're a little high-wasted, but so comfortable and flattering! The black and white pattern could go with nearly any solid-colored top that goes at least to the top of my hips. A little longer than I'm used to, but the fit is great, and the stretch lends itself to doing anything casual or a bit dressed up in these! Are you not a Stitch Fix customer yet? Get on board! You pay a $20 styling fee, but that then applies to anything you purchase from your box. There are no postage charges for you getting the box to you, or anything you don't like being sent back. For someone like me who has a hard time shopping with kids always in tow, it's a great way to try on some new clothes, and even style them with what's already in your closet, since you're at home ;) I don't expect to always keep all five items, but I got lucky this time, and half the packing for my Florida trip is DONE! Everything looks great. Can't wait til next week. I'm doing sunshine dances 😎. Beaches here we come. I like those first two shirts the best - very pretty! Lucky you getting to travel to FL too :) it was tooooo cold out today for me. Love! They did a great job- you look fabulous!! I've asked for warm weather clothes for two trips coming up as well, hope my box is as great as this. I like the Kut from the Kloth shorts and polka dot shirt. My Florida box is coming at the end of March. I hope you have a great time!